England manager Roy Hodgson has backed Jamie Carragher to become "one of the country's top young coaches" when he retires at the end of the season. Former England defender Carragher announced on Thursday that he will end his 16-year professional career in May. Hodgson worked with Carragher during his short time in charge at Anfield. "After retirement I'm sure he will march quickly up the coaching ladder and become one of the country's top young coaches," he said. Carragher, who is out of contract at the end of the season, has made more than 700 senior appearances for Liverpool, and is second only to Ian Callaghan in the club's all-time appearance table. "Having worked with Jamie Carragher it was always evident that he was a model professional who gave everything he had for club and country," added Hodgson. "He has had a fantastic career and will always be looked on very fondly by everyone associated with Liverpool Football Club. "It was good to see him back in the team recently, I hope that between now and the end of the season he is able to add to his great total of appearances for the club." Former England and Liverpool striker Michael Owen was also adamant that Carragher had a bright future in the sport. "I'm sure he's capable [of becoming a coach]," the Stoke forward told BBC Radio 5 live. "He knows everyone in every single league, he's certainly got the credentials. "It's whether he wants to do it and I'd hazard a guess that he would." 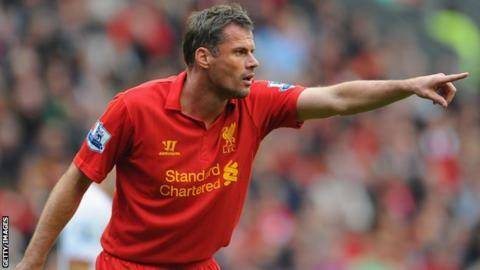 Ex-Anfield chief executive Rick Parry was in agreement, and said that Carragher is "the most extraordinary student of the game". "I think he is a future manager for sure," he also told BBC Radio 5 live. "He has been taking his coaching badges. He is the most extraordinary student of the game, he lives and breathes football and I am sure he has a career in the game if that is what he wants to do. "Jamie was an outstanding player, who always gave 100% who always wanted to play. You'd have to drag him off with a broken leg to prevent him from playing. There was never any prospect of him playing for another club other than Liverpool. "